Lamacchia Realty Inc. is happy to provide residents throughout the Canton, Massachusetts community with real estate services. Our team of local agents provide both home buyers and home sellers with exceptional services proven to work. The whole process of buying and selling a home can be stressful. Lamacchia Realty wants to be sure that we take off as much of that pressure as possible by getting you results and saving money while doing it. Lamacchia Realty Inc. provides home sellers with agents and an overall way of doing business that no one else can match. While understanding the market, and doing all the dirty work possible, we also put our homes through a marketing plan that is second to none. From television, social media and other listing sites to professional photography and reverse prospecting, we are here to get the results you’re looking for. If you’re interested in purchasing a home in the Canton or community, please reach out to Lamacchia Realty. Our top producing home buyer agents know how to get you the results you’re looking for. Located in Norfolk County, Massachusetts, Canton is a town plays home to 21,561 people (based on the census of 2010). The town lies about 15 miles from Downtown Boston towards the southwest and occupies a sizable area within Greater Boston. The median home price is $536,400. There are quite a few parks in Canton which are cherished for their scenic views and placid atmosphere. These parks are used for hiking, picnics and general rest and relaxation. Here are a few examples. Signal Hill: Signal Hill is a small hill with its summit resting 188 feet above sea level. It offers splendid views of the Great Blue Hill, which is located nearby, and of the entire Boston skyline. The hill has a small cartpath that leads hikers to the summit, while another short trail leads to the Neponset River’s banks. The banks serve as a launching zone for kayaks and canoes. This is where visitors usually begin their river trips or take a break to relax and unwind. Signal Hill also provides visitors with a basic idea about the region’s history. Canton was once home to the paleo-Americans, who settled in what is currently referred to as the Neponset River Valley. Signal Hill is also a great place for hawk watching. Hawks are often spotted here as they glide with the help of thermal drafts that occur between the Neponset River Valley and the Blue Hills. There is a lot of flora and fauna at the hill apart from the hawks. The park can be visited any time of the year, from sunrise to sunset. The Farnham-Connolly State Park: A relatively new development in Canton, the Farnham-Connolly State Park is a 6 acre piece of park area that is used for various purposes ranging from recreation to relaxation. It offers a parking area, paved paths, sun shelters, and wetland overlooks etc. There is also a memorial site located in the park. There are plans to develop a wildlife and pedestrian underpass around the marsh areas. Canton has one public middle school and one public high school; the William H. Galvin Middle School and the Canton High School, respectively. The Canton High School offers schooling from grade 9 to grade 12, while the William H. Galvin offers schooling from grade 6 to grade 8. 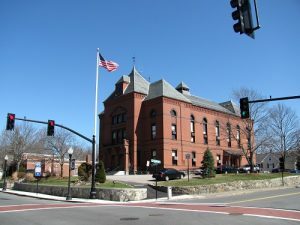 Apart from these schools, Canton is also home to 3 public elementary schools, namely, the Dean S. Luce School, the Lt. Peter M. Hansen School, and the John F. Kennedy School. There is also a private school in Canton known as St. John the Evangelist, which has been operating since 1883. The school caters to students from preschool to grade 8.